In the past three decades, Vietnam and ICRISAT have worked together on development of pro-poor biofuel supply chains, integrated watershed management and development of strategies for adaptation to climate change. ICRISAT in collaboration with the Vietnam Academy of Agricultural Sciences (VAAS) is also developing improved crop cultivars and technologies and in disseminating these technologies to farmers. The country has made remarkable progress in agriculture, especially doubling the productivity of groundnut in the past two decades. The success in agriculture is attributed to ICRISAT’s efforts and interventions in the country mainly of the 4,000 samples of germplasm and improved breeding lines provided to Vietnam by ICRISAT and the training imparted to over 300 scientists of VAAS. “Our partnership has yielded significant results and made an impact on the growth of agriculture in Vietnam. We share a common goal of harnessing the power of science in improving agricultural productivity, increasing farmers’ income and protecting the environment,” ICRISAT Director General Dr William Dar said. Dr Dar was speaking at the ICRISAT-Vietnam Partnership Day organized on 4 November at VAAS in Hanoi, Vietnam to celebrate the three decades of partnership in agricultural research for development (R4D) in Vietnam. 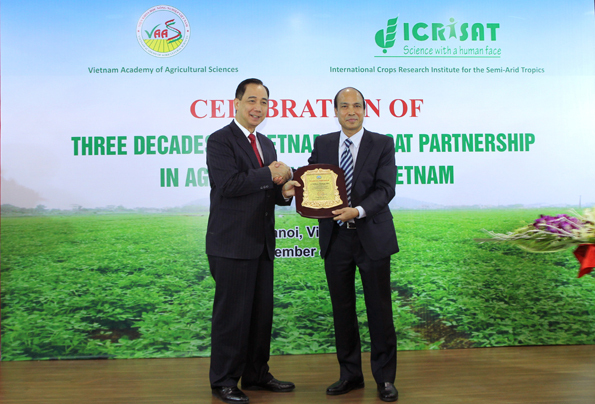 Dr Trinh Khac Quang, Acting President of VAAS, acknowledged the support received from ICRISAT in agricultural R4D and urged the institute to extend and upscale activities in the country. The event served as a platform to explore several priority areas for research collaboration between Vietnam and ICRISAT. Scientists from VAAS sought the support of ICRISAT in capacity building and also requested ICRISAT to open up a regional station in the country. At the celebration, VAAS honored Dr Dar for his outstanding contributions in strengthening the partnership between ICRISAT and the research and development partners in Vietnam. Nine scientists/research managers from ICRISAT including Drs CLL Gowda, SN Nigam, SL Dwivedi, Farid Waliyar, Rajeev Varshney, SP Wani, Pooran Gaur, HD Upadhyaya and GV Ranga Rao were also honored by VAAS for their significant contribution in R4D in Vietnam. ICRISAT also recognized 17 scientists and managers from Vietnam for their significant contributions through ICRISAT-Vietnam partnership. Several dignitaries including Mr Krishna Byre Gowda, Agriculture Minister, Government of Karnataka, India; Dr Le Quoc Doanh, Vice Minister, Ministry of Agriculture and Rural Development (MARD), Vietnam; Dr NT Dan, Former Vice Minister, MARD, Vietnam; Dr NV Bo, Former Director General, VAAS, Hanoi; and several current and former Directors and Deputy Directors of various institutes attended the event. Mr Krishna Byre Gowda, highlighted the benefits of ICRISAT-Government of Karnataka partnership in implementing Bhoochetana project in Karnataka. He appreciated the technical guidance received from ICRISAT in this project. Dr Le Quoc Doanh addressed the participants and ensured support of MARD in all future collaborations. Dr CLL Gowda, Deputy Director General-Research, ICRISAT, listing the achievements of ICRISAT-Vietnam Partnership in R4D in Vietnam, stated that ICRISAT and Vietnam have worked together in Asian Grain Legumes Network (AGLN), Cooperative Cereals Research Network (CCRN), Cereals and Legumes Asia Network (CLAN), and Asian Grain Legumes On-farm Research (AGLOR). Since 2002, the International Fund for Agricultural Development (IFAD) has been supporting efforts on enhancing adoption of improved cultivars and production technologies in Vietnam. 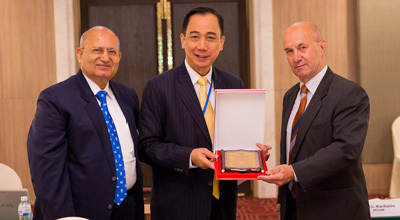 The Asia-Pacific Association of Agricultural Research Institutions (APAARI) honored ICRISAT Director General Dr William Dar with a plaque of appreciation in recognition of his invaluable support to the Association at the 12th Asian Maize Conference and Expert Consultation on “Maize for Food, Feed, Nutrition and Environmental Security” organized at Bangkok, Thailand from 30 October – 1 November. Research by ICRISAT and partners reveals that rural per capita income is on the rise in the semi-arid regions of India and Bangladesh. Adoption of high yielding varieties and access to farm equipment and livestock resources played an important role in the increase in income. Another trend is that although farm households in South Asia still rely on agriculture for 80-90% of their income, nonfarm employment is on the rise. The nonfarm sector in India now employs about 33% of the rural work force as against only 20% in the eighties. These insights were shared at the mini-symposium on ‘Rapid Transformation of Rural Economies in South Asia: Insights from Village Dynamics Studies’ held at Dhaka, Bangladesh, on 14 October. A key presentation documented that the per capita income of rural households reported an increase of 10% in Bangladesh and 4% in the semi-arid regions of India during the period 2010 to 2012. The figures for east India, however saw a 4% decrease. In east India, nonfarm employment as the main occupation increased from 42% in 2010 to 51% in 2012. In the semi-arid regions of India nonfarm activities increased from 39% in 2010 to 43% in 2012. In the Indian states of Telangana and Maharashtra, nonfarm activities provided employment to 45% of the rural workforce in 2012. In Bangladesh as much as 60% of the labor force was engaged in nonfarm activites as the main occupation. Another presentation featuring the relationship between changes in agricultural wages, crop productivity, profitability and farm income showed that factors like technology (fertilizers, hybrid varieties) and social factors (education levels of farm households) have positively contributed in enhancing crop productivity and crop profitability. An additional spending of ` 1 (US$ 0.06) on fertilizers increased crop profitability by ` 1.48 (US$ 0.02). An additional year of schooling by the head of the household is associated with an increase in crop profitability by ` 2,985 per ha (in 2009-10 constant prices). The results also show that an increase in male wage rates has decreased farm profitability significantly. The gender impact of diversification from rice to commercial aquaculture in Bangladesh was discussed. Aquaculture decreased the workload of women as compared to rice cultivation but made women more dependent on their husband’s income and lessened their control on how the income was spent. Women were not aware of the exact income earned from fish/shrimp farming since the men dealt directly with traders. Though aquaculture increased household income and food security, it made self-sufficient rice producing households more dependent on the market for their staple food. Another presentation dealt with the threats to future rice production and food security in Bangladesh due to decreasing availability of farm labor and ageing of the farming population. The paper showed that the growth rate of farm labor declined from 1.6% in 1980 to 0.32% in 2010. By 2020, the growth rate of farm labor is projected to be zero or negative. Another alarming fact is that the average age of the farming population has gone up from 36 to 46 over the period 1988 to 2011. During the discussions, it emerged that given the richness of the longitudinal data available, an attempt can be made to create a human happiness index considering several socio-cultural-economic factors. Thus, the village level studies should strive to document the impacts of rural transformation on human happiness and derive implications for future research, institutions and policy changes. The symposium was organized to discuss the findings of the Village Dynamics in South Asia (VDSA) project and was organized by ICRISAT Research Program – Markets, Institutions and Policies. Dr Mruthyunjaya, Member, VDSA Advisory Committee chaired the symposium and Dr N Nagaraj, Principal Scientist (Economics), ICRISAT, was the co-chair. 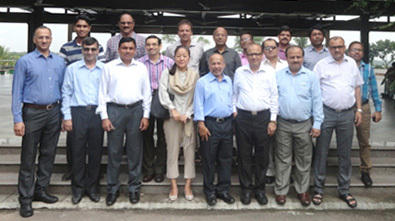 Fourteen papers were presented at the symposium by scientists and researchers from ICRISAT and its partners: International Rice Research Institute (IRRI), International Food Policy Research Institute (IFPRI), Center for Environmental and Geographic Information Services (CEGIS) and Socioconsult Ltd. The VDSA project is supported by the Bill & Melinda Gates Foundation and undertaken as part of the CGIAR Research Program on Policies, Institutions and Markets.